← Spring Has Sprung: How to Get the Perfect Wash! #FitnessFriday: Tips To Get You Moving! We know it can be hard to get energized right out of bed. But your daily commute doesn’t have to be a drag and you definitely don’t have to walk through the day like a zombie. To help you get moving, we’ve listed out some tips to help you through your day. Breakfast fills your “empty tank” to get you going after a long night without food. And it can help you do better in school. Easy-to-prepare breakfasts include cold cereal with fruit and low-fat milk, whole-wheat toast with peanut butter, yogurt with fruit, whole-grain waffles or even last night’s pizza! Snacks are a great way to refuel. Choose snacks from different food groups – a glass of low-fat milk and a few graham crackers, an apple or celery sticks with peanut butter and raisins, or some dry cereal. If you eat smart at other meals, cookies, chips and candy are OK for occasional snacking. Balance your food choices – don’t eat too much of any one thing. You don’t have to give up foods like hamburgers, french fries and ice cream to eat healthy. You just have to be smart about how often and how much of them you eat. Your body needs nutrients like protein, carbohydrates, fat and many different vitamins and minerals such as vitamins C and A, iron and calcium from a variety of foods. 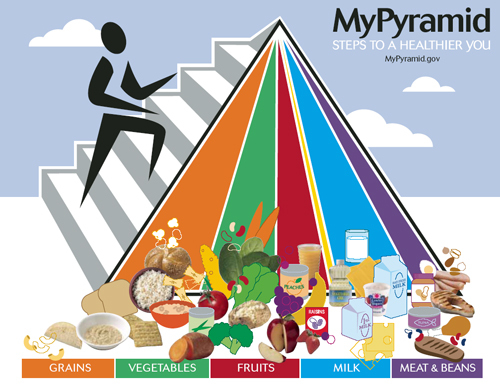 Balancing food choices from the Food Guide Pyramid and checking out the Nutrition Facts Panel on food labels will help you get all these nutrients. Eat more grains, fruits and vegetables. These foods give you carbohydrates for energy, plus vitamins, minerals and fiber. Besides, they taste good! Try breads such as whole-wheat, bagels and pita. Spaghetti and oatmeal are also in the grain group. Bananas, strawberries and melons are some great tasting fruits. Try vegetables raw, on a sandwich or salad. Foods aren’t good or bad. A healthy eating style is like a puzzle with many parts. Each part — or food — is different. Some foods may have more fat, sugar or salt while others may have more vitamins or fiber. There is a place for all these foods. What makes a diet good or bad is how foods fit together. Balancing your choices is important. Fit in a higher-fat food, like pepperoni pizza, at dinner by choosing lower-fat foods at other meals. And don’t forget about moderation. If two pieces of pizza fill you up, you don’t need a third. Posted on March 23, 2012, in 2012 Biggest Loser Challenge, Fitness and tagged 2012 Biggest Loser Challenege, biking, calories, cardio, diet, exercise, fat, fitness, food, health, healthy, jogging, Krystal Koons, running, snacking, snacks, Tiffany Koons, Tips To Get You Moving, weight loss. Bookmark the permalink. 2 Comments.